Japan's Prime Minister Shinzo Abe speaks during a news conference at his official residence in Tokyo, Japan, October 6, 2015. Japanese Prime Minister Shinzo Abe praised on Tuesday the Trans-Pacific Partnership (TPP) deal agreed to by 12 Pacific Rim countries and voiced support for China to join. “It would contribute largely to our nation's security and Asia-Pacific regional stability, and it would have significant strategic meaning if China joined the system in the future," Prime Minister Abe said at a news conference. Advocates of the United States-led agreement that would liberalize trade for 40 percent of the world economy say it is needed to compete with rival China’s growing economic power. But supporters are not opposed to Beijing joining the agreement. They say if China joins, it would impose fairer trade standards on the world’s largest economy. Details of the agreement have yet to be released, but the United States Trade Representative said TPP will eliminate more than 18,000 tariffs on American exports alone and will establish strict labor, environmental and anti-corruption regulations. The agreement must still be ratified by lawmakers in the participating countries: Australia, Brunei, Canada, Chile, Japan, Malaysia, Mexico, New Zealand, Peru, Singapore, the United States and Vietnam. Koichi Nakano, a professor of political science at Sophia University in Tokyo, said there are no clear-cut winners or losers among the participating countries. “It depends on your economic position within those countries whether it is a good deal or not,” Nakano said. In Japan, Prime Minister Abe’s Liberal Democratic Party coalition has the needed votes in parliament to approve the TPP but will likely face strong opposition from an agricultural sector that will have to compete with cheaper beef and other imports because of lower tariffs. Australian Trade Minister Andrew Robb said his country could, over time, nearly double exports of sugar to the United States from 107,000 tons to 207,000 tons. New Zealand Prime Minister John Key said the reduced tariffs on 93 percent of his country’s mostly dairy product exports were less than what he wanted but overall represented a good deal. Manufacturers operating in low-wage countries such as Vietnam will benefit from increased access to the U.S. and Japanese markets but would also be required to adhere to higher labor and environmental standards. The TPP also will likely result in higher prices for imported products like drugs and medications. Under the TPP, drug companies developing new medications would have an effective monopoly for about eight years before facing lower-cost, generic competition. South Korea, which has focused more on developing bilateral free trades deals, called the agreement, “the largest economic framework of the Asia-Pacific region,” and expressed interest in becoming a member. 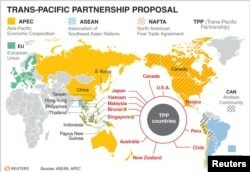 "Our government's position is that we are planning to consider participating in the TPP," Vice Prime Minister Choi Kyung-hwan said. Thailand and the Philippines are also considering joining. Opponents of the agreement argue that secretly negotiated deals such as the TPP benefit business interests at the expense of the public good. For example, the TPP contains an investor-state dispute settlement (ISDS) system that gives foreign investors the right to sue national governments over regulations that might reduce their profits. Tobacco companies used the ISDS provision in a Hong Kong-Australia investment agreement to sue Australia to remove safety warnings imposed by the state in the form of explicit photos of different forms of cancer placed on cigarette packages. “Even if we are told at this stage that this is going to be the gains for the workers all around the world including developing countries like Vietnam, well they are not being represented in the negotiations so far,” he said. In Asia as in the U.S., Nakano said, the TPP will advance economic growth but will also add to the growing wage gap, and spark strong public resentment and protests against globalization and capitalism.